The God of the elephant face is He before Whom the Lord of speech and the other kindly ones bent at the beginning of all their undertakings, and accomplished so may it ever be what they were fain to do : him I too worship. I worship him whose breath the Vedas are, who from the Vedas made all the world, vidyatirtha, Who is Mahesvara. He looked, and king Bukka put on His form; and bade the teacher Madhava expound the Vedas. Having already explained concisely the Purva and the Uttara Mimamsas, the merciful Madhava sets himself now to tell the meaning of the Vedas. Inasmuch as the business of the adhvaryu priest is of first moment in the sacrifices, the Yojurveda has been first explained: now for the sake of the hotr's work the Rgveda will be explained. Let but the first adhyaya here be listened to after ancient wont: he who is well versed in that much will be wise to know the whole. Here some say, "Throughout the Scriptures the Rgveda is always mentioned first". The grammarians lay it down that of two or more things mentioned together the most honoured is put first. It follows that the Rgveda is of all the Vedas that held in highest honour. And it therefore should have been first explained. This primacy of the Rgveda is very clear in the Purusa Sukta, "From that yajna invoked of all men, the verses of the Rgveda and the verses of the Samaveda were born: the songs of the Atharvaveda were born from it, and from it the Yajurveda was born." By yajna, that is yajaniya, "to be worshipped, held in honour, is meant the Supreme God, here called the Man with a thousand heads. He is sarvahuta that is called upon by all men. Although Indra and the other gods are invoked in many texts there is no contradiction. Inasmuch as these are only the Supreme God in the form of Indra and other such gods. and so it is said in another text, "they call Agni, Indra, Mitra, Varuna and he is the strong – winged divine Garutman : He is one, but wise men call him by many names and call Agni, Yama, Matarisvan." The Vajasaneyins also have this text, "He of whom they say Worship Him" or 'Worship Him' His is the world, he is all the gods." in this way it is the Supreme God and no other who is invoked of all men. Nor does the primacy of the Rgveda depend only on the fact that it is mentioned first. 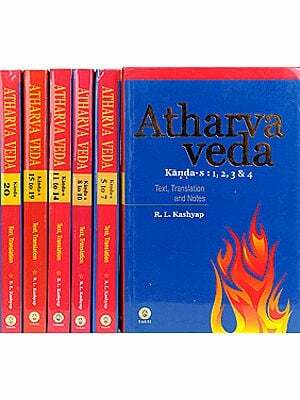 It follows also from the way in which that veda is used to confirm the parts of the sacrifice. 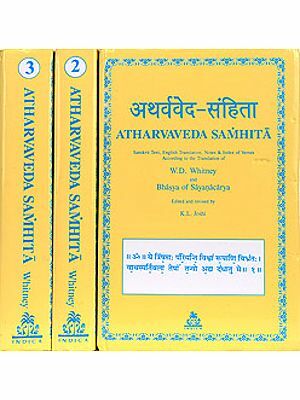 Thus, for example, the Taittiriyas have the text "Whatever in the sacrifice is done on the authority of a verse of the Sama – or Yajur – Veda is liable to be upset; what rests on a verse of the Rgveda is firm." In the same way the Brahmanas of all the Vedas in order to strengthen confidence in what thay asy quote only the Rgveda saying "thus and thus it is laid down in a verse of the Rgveda" . And in the mantra portion itself of the yajurveda many verses of the Rgveda are given as to be used by the adhvaryu Priest. That all the verses of the samaveda are actually in the Rgveda everybody knows. The Atharvanikas, Too, in their Samhita, for the most part, quote only verses from the Rgveda. Thus from the respect paid to it by the other Vedas it is clear that the Rgveda enjoys this primacy. The Chandogas, too recite a speech of Narada's to Sanat-kumara, which implies this pimacy,"Lord, I study the Rgveda and the Yajuraveda, the Samaveda and the Atharva- veda." And in the Mundakopanisad we have the text, "The Rgveda, the Yajurveda, the Samaveda the Atharvaveda." Also in the Tapaniyopanisad the order of study of the Vedas is thus given, "The Rg. Yajur, Sama, Atharva, four Vedas with their Angas and their Sakhas are the four feet. Similar instances might be found everywhere. From all which it should be clear that the Rgveda enjoys this primacy, and that it therefore ought to have been first explained.